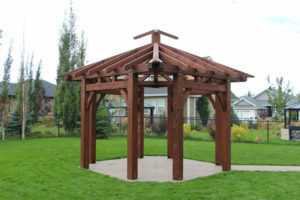 I just had a beautiful 19-foot diameter Douglas Fir octagonal gazebo prepared for me from a friend in BC. When it arrived, I soon realized it was too big to try and assemble myself. Fortunately, I found Bruce Stobbe at McLeod Creek Timber Frame Company. As luck would have it, he was in between projects and available immediately. From the moment he came out to do an estimate and look over the project to the final nail that he placed on the last ridge cap, he exceeded my expectations. Bruce is very knowledgeable about construction and timber framing and meticulous in paying attention to detail. A hard worker, he is worth every penny that he charges. He comes very well prepared with a variety of modern tools and shows up like clockwork. He has a strong emphasis on safety and does not cut corners. It is obvious he takes as much pride in erecting someone else’s work as he does his own. 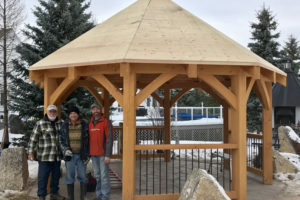 Making a decision about selecting a timber framer is difficult, I made the right one in having Bruce help us put our beautiful timber frame gazebo. The final touch was when he presented us with a selection of caps and tee shirts with his logo on them, which I will wear with pride. We met with 5 different Timber Frame Companies before deciding on one. After meeting with Bruce for the first time, we knew we wanted him as our contractor. It was his passion for the job, his friendly and personable demeanor and his craftsmanship that stood out. I like the intimate nature of McLeod Creek – it was always one on one service. We knew that our plans and wishes were being heard and there was little room for miscommunication and it was easy to relay our wishes and desires. Bruce was readily available to answer emails and phone calls and answer any questions we had along the way and throughout the entire building process. He was easy to contact and very approachable with requests, concerns or comments. The design of our timber frame surpasses what we envisioned. To be honest; I was skeptical to commit to a “timber-frame” but it was my husband that sold me on the idea. Our timber frame is now more than anything I would have ever imagined; it is truly jaw-dropping the moment you walk in the front door. Seventeen-foot ceilings with open timber rafters provide a grand entrance that you don’t see in a normal bungalow. Our timber-frame is beautiful, elegant and the focal point of our house. It is truly a piece of crafted art. We simply love it. The timbers are solid wood, and therefore subject to checking and splitting. They have begun to check, and some of the timbers have some interesting cracks down the sides already; a natural occurrence we were warned about with using green timbers. 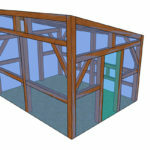 Our hybrid timber frame was a slower process than a standard conventional stick frame. We knew from the beginning that Bruce was not available to start on our project until early August. Unfortunately, the beginning of August was pushed back to mid/late August, and the remaining conventional framing was therefore delayed as well. The actual raising of the timber frame structure itself was impressively quick when the time came to assemble the timbers. Bruce had everything correctly measured and cut; the pieces fit together perfectly like a puzzle. One issue that was a little deceiving was picking the color of the stain. I was a little disappointed when I originally viewed the stained timbers in person for the first time. This was when the timbers were in the shop. It didn’t seem to be an exact match of the color I picked in store. I had wanted something a little darker, and the timbers were revealing a ‘redder’ tone than I desired. However, the assembled timber structure looks much different/darker and is very pleasing and true to the colors I had picked. Maybe the timbers needed time for the stain to set in? The true color I see now with the assembled structure is perfect. I love the two tones you see with the wood grains (we used black poplar with a clear coat for our ceiling tongue and groove structure), and I don’t feel that the timbers have much of that red tone I originally saw in the shop. Overall, we are loving our hybrid timber frame house. 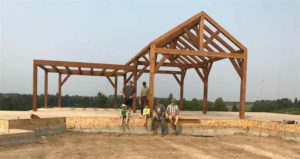 We would highly recommend McLeod Creek Timber Frame for the craftsmanship, skill, personable service and most importantly, the finished product you will receive. The open rafters with the large posts and beams give such character to our home and impressive beauty and design. I can’t wait to finish this build so we can move in and enjoy our forever-home. Thanks for all your help Bruce. Not an easy road for me but I know your input will pay off for me at a later date and looking forward to those days soon. All the cabinet/millwork /stair carpenters that come to site always take the time to look at the timber work. One guy was from Germany who did some there and was looking at the scarf and mortise connections closely. Everyone is impressed with the look overall. Bruce, you did a good job of keeping communications open considering the circumstances. No hesitation to work with you again in a different project environment. 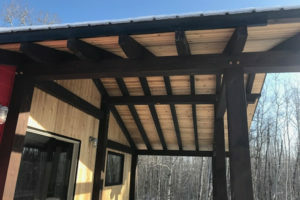 It’s pretty cool how you were able to figure out what I was thinking in terms of the design for the covered deck, especially with the double roof. Most people didn’t understand how it was supposed to look until the roof finally went on. Considering the numerous space constraints you had to deal with (doors, windows, roof height), I think it’s amazing how it looks like it was part of the original house plan. It doesn’t look like an afterthought. 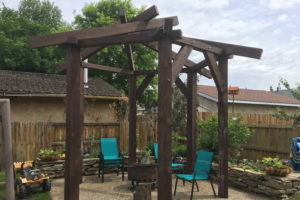 For the pergola, I didn’t give you near the amount of input except I wanted it “beefy,” nothing curvy and the tie in with covered deck. But you still were able to deliver. Get a huge amount of comments on both. Would I change anything? Honestly, no – because it looks better then I imagined it would have. I’ve definitely taken notice of other timber work since getting mine and can’t compare. Also seen a couple pergola “kits” in some yards/Costco/etc. No comparison. By far the best money spent on deck. Or entire house. I know I got a great deal so hard for me to judge. I was never worried about what you were going to deliver, and that was before the meetings and emails used to verify what I wanted. I can say I gained a huge appreciation for what you do. The design is fitting exactly as we pictured. In fact, it looks better than imaged or on paper. Timber framing showcases the beauty of the wood and architectural details that is so unique. Craftmanship is superb. We really appreciate the lengths that you went to in order to accommodate our vision and make it a reality. We very much appreciated that you had an eye on our budget and had ideas to keep our expenses lower, like rolling our order together with others to keep delivery costs lower. The on-site construction process was excellent. Working under your direction, there was never a point where there was any confusion or any safety issues. The relationship was excellent. We appreciated that you were happy to invite us to your workshop and see firsthand how some of the pieces are made. We would certainly recommend your company to others and already have. You would be at the top of our list for potential future projects. We have no problems with prospective clients contacting us. 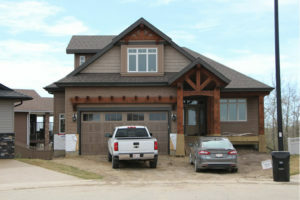 Thank you, Bruce and the McLeod Creek Timber Frame for the excellent job on our beautiful home. We have received many positive compliments on the timber framing. The design and quality of work are excellent along with giving our home an instant street appeal. 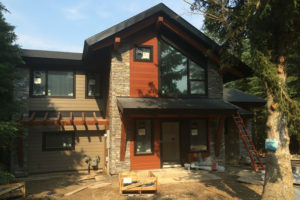 The process from idea to completion was made enjoyable as McLeod Creek Timber Frame listened to our ideas and then helped bring our vision to reality. The schedule and cost for our project were completed in good time with a price that was competitive for the timber frame industry. Thank you, Bruce, and everyone at McLeod Creek Timber Frame for making our dream come true! I only have positive feedback for you. The design is exactly what we were looking for. We appreciated your suggestions and amendments to the ideas we submitted to you. The quality is top notch. Our project manager was particularly impressed by the quality given – he has more experience with seeing other products out there. The cost was very reasonable. We had priced out another source that involved cladding rather than solid wood. I believe we got a superior product for less cost. The product was delivered as promised in a more than reasonable time frame. We would definitely recommend your services to other potential clients. We would also use you again for future products. 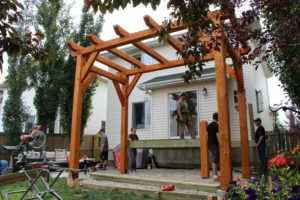 Our pergola project was a great success! It involved strategic planning, in the beginning, to fully understand the product that we wanted. The quality of the pergola is outstanding, you can tell by the little details, how all the pieces fit so precisely together. It’s remarkable! It makes me envious, and when people come to my house and stare in awe, I wish I could tell them I did it. Anytime you’re doing a project, schedule and cost are huge factors. In this project, the cost was very fair, and the schedule was set months in advance, and we nailed it. I have in the past and definitely in the future will recommend McLeod Creek Timber Frame Company to anyone looking for this type of product! I will be returning to Bruce and his remarkable craftsmanship for any future projects that I scheme up. The design was exactly as we wanted it. We worked with you on a few different styles until we came up with something that we liked. We worked together on an anchoring system that was simple and cheap, yet pleasing to the eye. The quality was fantastic. All the pieces fit together very well. We have had numerous compliments on the quality and design of our gazebo. I feel that cost was in-line with what we received. Service was great. I have no doubts about Bruce’s experience or ability to do a job of any size or complexity. We will definitely use you for any future projects. We gave Bruce a couple different ideas of the type of designs we were looking for. We could only find some design characteristics online from other gazebos and never one that had all of the design features we were looking for. So, we gave Bruce a list of various design features we wanted, and he was able to design us a structure that incorporated all these different ideas we had. We are really happy with the final result. The design of our gazebo is exactly what we were hoping for. Bruce was able to build a final product that was exactly as the design drawing. There were no surprises. Our gazebo is top notch! We have received many positive comments from neighbors, family & friends regarding how great it looks! Being our gazebo is a smaller project, Bruce was very transparent that he would order our material with his next order so that our delivery cost would be less as sharing trucking costs. We understood the schedule Bruce told us to get our gazebo built. We are happy with the process for our gazebo to be completed. We feel our gazebo was definitely worth the cost. It was added a lot of character and value to our backyard. 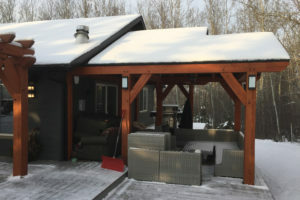 It has created a space where our family gathers under it to enjoy family time at a fire pit. We were confident that Bruce would delivery a quality gazebo, and he didn’t disappoint. Bruce treated us like family! I would definitely recommend Bruce to others! The design is what we originally planned for. It was great to have the rendering up front and set our expectations based upon that. The quality of the craftsmanship of the amphitheatre is spectacular. We love the looks and functionality of it. McLeod Creek worked with our budget up front and was able to provide the design and quality to fit within the budget. We are thankful that you donated your time to this project. 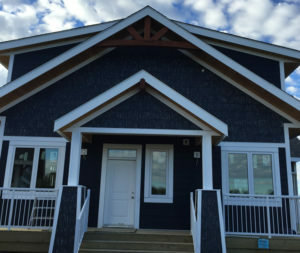 Based on the quality of the service and that you are a community-minded individual, I would recommend McLeod Creek Timber Frame Company.